The Duolite® feature offers maximum light control by using two separate fabric panels to achieve a 'day/night' level of convenience, providing limitless options for privacy and light control. This revolutionary Modern Roman Shade boasts luxurious fabrics paired with variable light control, giving any room the perfect balance of style and function. The sheer or light-filtering flat-fold front shade and the room-darkening back panel both roll onto a single roller. Once the shade is completely lowered, the back panel can be deployed to achieve varying levels of light control and privacy. Vignette Duolite is available exclusively with PowerView® Motorization. Energy-efficiency, meet manageable light control. With a seamless, integrated design, Duette Duolite fuses two different fabrics together into one shade, allowing you to control the temperature in each room, while also beautifully filtering light during the day and providing darkness when you sleep. 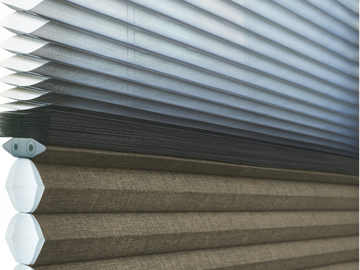 The Duolite option is also available on Applause Honeycomb Shades as well as our Pleated Shades. 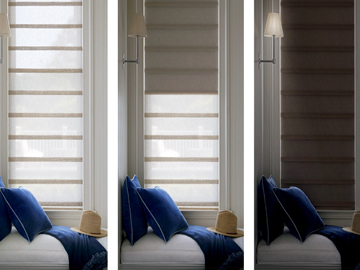 Our trademark Silhouette fabrics feature soft adjustable fabric vanes that beautifully diffuse harsh sunlight while offering privacy options for both day and night. The ingenious Duolite system features a classic translucent Silhouette shading in the front with a room-darkening roller shade in the back, allowing for gorgeous open views to complete privacy (or any level in-between). We offer stylish custom window fashions, the best in brand name products, superior service and guaranteed professional installation. You’ll be impressed by the many choices of color, style, texture, fabric and function. 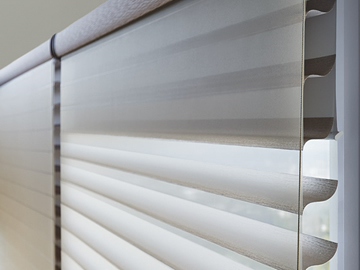 To offer the best quality and product innovation, Chase's Carpet & Blinds features Hunter Douglas window fashions. We carry a full line of Hunter Douglas Blinds & Shades expertly installed by our master installers there to answer all of your questions and to ensure that your custom order is built to your exact specifications.
. Chase's Carpet & Blinds . All Rights Reserved.